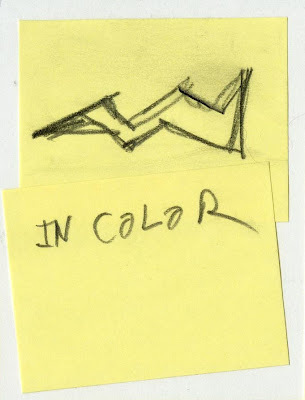 Well... actually not too much to say, but thought I'd post a couple post-its. 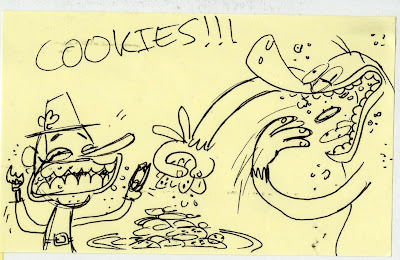 I got Joey cookies one day and left this drawing on them. srry I haven't commented in ages but i've been sooper assed busy with school and shiz! but after no looking at your blog for like 6 months i'm like WOW!!! manny and khan looks so awesomely terifically sweet balls!!! It would be A TOTAL HONOUR to work on that show or just to work with you and joey! Post-it communication is amazing! Love the doodles on them, makes me laugh every time I see them. Good to hear it's going well for you. I couldn't stop doodling Manny either, and it's hard to explain where he came from to my teachers haha. Can't wait to see it! Xilam did the animation? Hehe that's cool. And thanks for the comment! I'm Spanish. Sorry for my mistakes in your language.